We offer a Fire Extinguisher Servicing and Maintenance service. Our Engineer will call once a year to perform the inspection, servicing and maintenance of your fire extinguishers. There is a charge of £27.50p for this visit and a further charge of £6.75 per extinguisher checked plus parts needed. There are other associated costs depending on the age of the units and I attach a scale of charges. Inspection by the user, conducted at least monthly. Basic service, conducted at least on an annual basis. 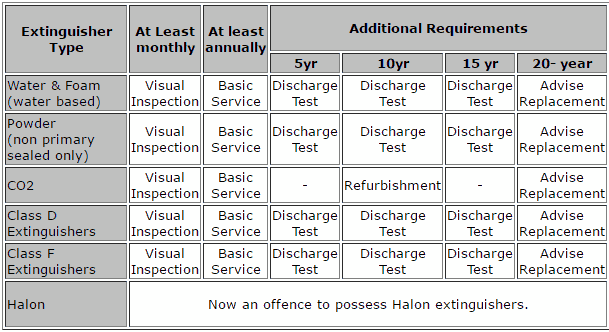 Extended service including discharge testing or refurbishing, which, except for CO2 extinguishers and a few certain other exceptions, is carried out after the first five years, and then at five yearly intervals thereafter (as shown on the table below). In addition to being a recommendation of BS 5306-3:2003, stretch testing CO2 extinguishers after 10 years is actually a legal requirement under the Pressure Systems Safety Regulations 2000. Replacement, which should be performed at no later than at age 20 years. Please note – its is recommended that extinguishers be replaced at 5 yearly intervals as the cost to perform a discharge test and then refill is not economical.